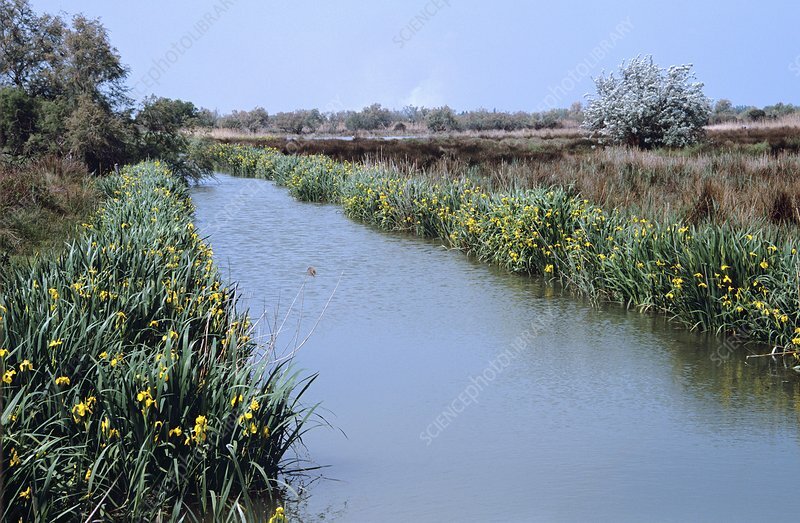 Irrigation channel lined with yellow flag iris (Iris pseudacorus) flowers. This channel is located in the Camargue region of France. The Camargue is a delta at the mouth of the River Rhone where it meets the Mediterranean Sea. It is a vast plain comprising large brine lagoons (etangs) cut off from the sea by sandbars and encircled by reed-covered marshes which are in turn surrounded by a large cultivated area. Approximately a third of the Camargue is either lakes or marshland.